If you need a festive cake that is not that hard to make (trust me, as a former cake-o-phobe, I know what I’m talking about), look no further. 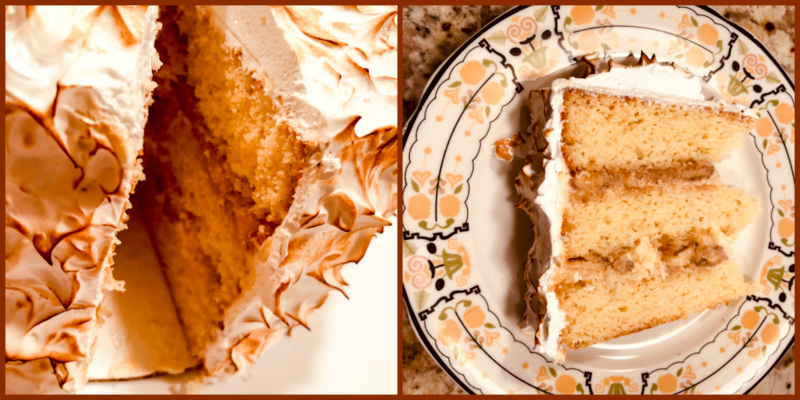 Inspiration came from several sources: cake from one cookbook, icing from another, filling from my own imagination, based on my Mom’s “doce de banana”. It was one of the very few sweets she made regularly, as both my Dad and I were crazy about it. I had to control myself not to say we went bananas for it. There, I just said it. Good memories. Make the cake. Heat oven to 350 F. Grease the center and perimeter of three 8 inch round cake pans and line the bottom with parchment paper. Grease the center of the paper. In the bowl of an electric mixer, cream the butter and sugar, add the eggs, one at a time, and the vanilla paste, beat until combined. In a large bowl, sift the flour, baking powder, and salt. Add to the mixer in three additions, alternating with the milk, beginning and ending with the flour. Beat on high-speed for 3 minutes, cleaning the bowl midway through. Divide the batter in the three pans, bake for 30 to 35 minutes, until a toothpick comes out clean when inserted in the center of the cake. After the cakes cool in the pan for 10 minutes, invert them on a rack and allow them to completely cool. Make the custard frosting. Mix the sugar and flour inside a saucepan. Add the egg and egg yolk, whisk vigorously. Add the milk and vanilla and mix very well. Heat gently over medium-low heat until the mixture boils and thickens. The goal is to have the consistency of pudding. Let it cool completely. Beat the butter and icing sugar in an electric mixer using a wire whisk. When they are very well combined and creamy, add the cooled custard prepared before. Beat on high-speed for 7 minutes, until it thickens. Make the filling. Melt the butter in a large non-stick skillet, add the brown sugar and cook until it starts to dissolve. Add the slices of banana, the heavy cream, and cook everything together until the bananas start to get golden brown and the cream thickens slightly. Cool and reserve. Assemble the cake. Toss the fresh slices of banana with lemon juice and reserve in a small bowl. Place one cake layer over a cake stand, and spread with a very thin layer of custard frosting. Add half the caramelized bananas, and half the fresh banana slices. Set the second cake layer on top. Add a thing layer of custard, and the remaining of bananas, caramelized and fresh. Top with the final cake layer, bottom side up. 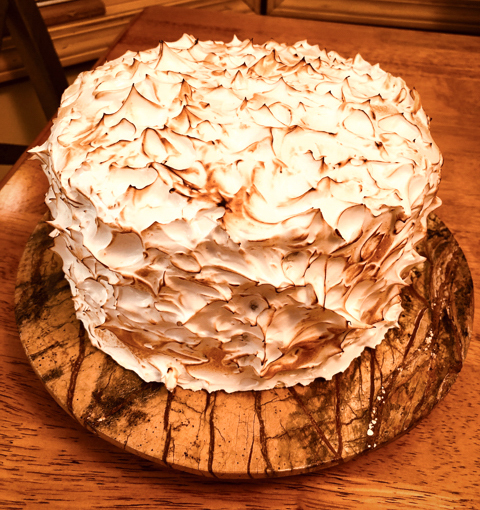 Coat the whole cake with frosting, make it a thin layer, no need to worry about covering the surface, because the meringue icing will take care of that. Keep in the fridge until frosting, for at least a couple of hours. 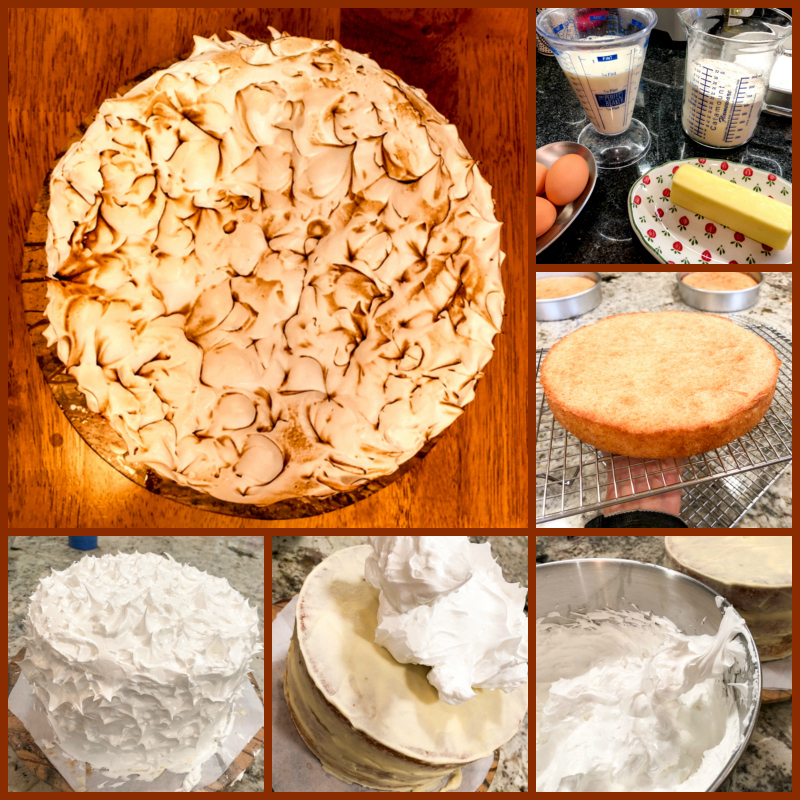 Make the meringue icing. In the bowl of an electric mixer, mix the egg whites with the sugar and place over a pan with simmering water. Heat until the sugar is fully dissolved and the mixture feels warm to the touch. Immediately hook the bowl to the mixer and beat in high-speed until stiff peak forms. 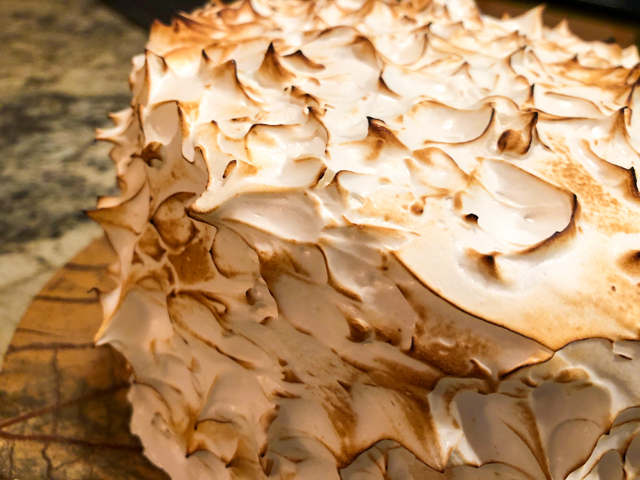 Remove the cake from the fridge and add a thick coating of the meringue frosting. You can then add all sorts of swirls and spikes to the surface, using either your bare fingers (a bit messy), or the back of a spoon. Have fun with it. Torch the surface to give a nice effect all over. Don’t burn it to the point it gets black, because then the sugar will taste bitter. Comments: I have four tips for you when it comes to cake baking. Tip #1: Get that mis-en-place going. When you measure all the ingredients and lay them up spatially in the order they will be used, your life will be a lot easier. And the probability that you will forget the melted butter in the final stage of genoise preparation will be considerably reduced. Tip #2: Have all ingredients at room temperature, eggs, milk, oils, butter. They incorporate better that way, and you will have a smoother batter. You can soak eggs in warm water for 5 minutes in case you forgot to remove them from the fridge. Tip #3: Sift the leavening agent with other dry ingredients. This will disperse the powder (baking soda, baking powder) uniformly, ensuring that your cake will rise evenly. Tip #4: For cake layers that are perfectly leveled, spray or coat just the center of the pan with your greasing agent of choice (Pam, butter), and a light coat on the sides. Amazing how well that works. If you look at the composite picture, I included a shot of one of the cakes when I just inverted it out of the baking pan. No trimming was needed in any of the three cake layers. I cannot take credit for this baking tip, it’s something I saw over at Pastries Like a Pro and have been using for a long time now. Always works. Thank you, Helen! Some bakers recommend those Wilton bands that go around the cake pan to ensure even baking. I’ve tried them, and found that the cake ended up with a sort of “steamed” quality I did not care for. Maybe that could be fixed with a slightly longer bake, but to me nothing beats the trick of greasing just the center of the pan. It’s so much easier than messing with those bands soaked in water. This is a big, hearty cake, a small slice will be enough, but you will be tempted to go back for another little sliver. The contrast of caramelized bananas with a few bites of fresh fruit made the cake even more flavorful and cut through the sweetness of the filling. For the future, I would reduce the amount of icing (maybe start with 3/4 cup of egg whites and decrease the sugar proportionally), as it made way too much. It was a recipe from Fine Cooking and they said it would be enough to cover one 9-inch round cake. In my opinion, that amount would be enough to cover two of those with some to spare and flick at drooling dogs standing nearby. I made the cake on Sunday but added the frosting Monday morning just before taking it to the department. I don’t think meringue icing holds up very well and was afraid it would be compromised after a night in the fridge. It was a ton of fun to torch it, maybe next time we should try to make a video. Everybody loved this cake, even though it was massive, it was gone before 11am. I call that a successful Mondays with Sweetness deal!